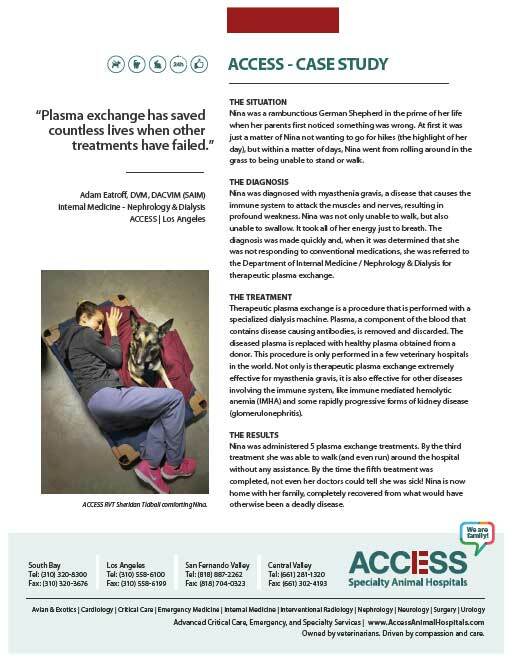 Plasma exchange has saved countless lives when other treatments have failed. Nina was a rambunctious German Shepherd in the prime of her life when her parents first noticed something was wrong. At first it was just a matter of Nina not wanting to go for hikes (the highlight of her day), but within a matter of days, Nina went from rolling around in the grass to being unable to stand or walk. Nina was diagnosed with myasthenia gravis, a disease that causes the immune system to attack the muscles and nerves, resulting in profound weakness. Nina was not only unable to walk, but also unable to swallow. It took all of her energy just to breath. The diagnosis was made quickly and, when it was determined that she was not responding to conventional medications, she was referred to the Department of Internal Medicine / Nephrology & Dialysis for therapeutic plasma exchange. Therapeutic plasma exchange is a procedure that is performed with a specialized dialysis machine. Plasma, a component of the blood that contains disease causing antibodies, is removed and discarded. The diseased plasma is replaced with healthy plasma obtained from a donor. This procedure is only performed in a few veterinary hospitals in the world. Not only is therapeutic plasma exchange extremely effective for myasthenia gravis, it is also effective for other diseases involving the immune system, like immune mediated hemolytic anemia (IMHA) and some rapidly progressive forms of kidney disease (glomerulonephritis). Nina was administered 5 plasma exchange treatments. By the third treatment she was able to walk (and even run) around the hospital without any assistance. By the time the fifth treatment was completed, not even her doctors could tell she was sick! Nina is now home with her family, completely recovered from what would have otherwise been a deadly disease. ACCESS RVT Sheridan Tidball pictured below comforting Nina. Eddie was brought to ACCESS as soon as his parents realized something was not right. Within minutes of his appointment, preliminary blood work showed the unthinkable: Eddie’s kidneys were failing. A day later, he was no longer producing urine, and toxins normally removed by the kidneys were reaching life-threatening levels. Acute kidney injury occurs when the kidneys suffer from an insult. Often times this is due to infection, exposure to a toxin, or an attack by the body’s own immune system. Sometimes the insult only results in minor dysfunction. 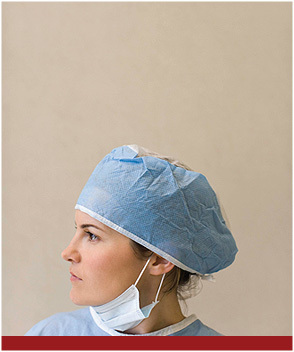 However, in many cases, the dysfunction is severe enough that the patient requires hospitalization. In these cases, the probability of survival can be less than 50%. For patients requiring hospitalization, hemodialysis is considered one of the most effective measures taken to allow for recovery. 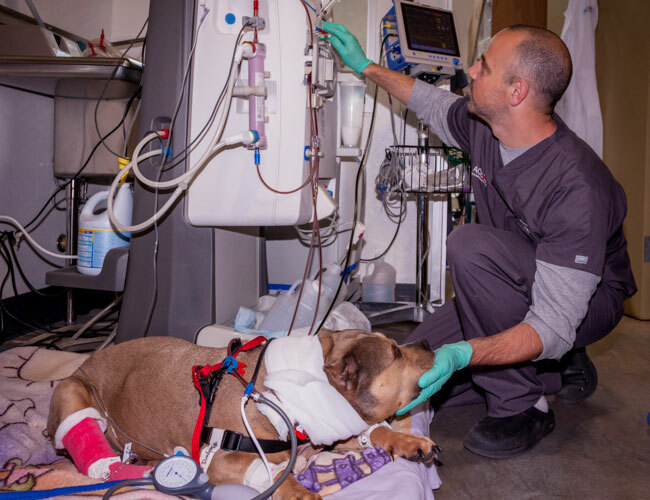 Eddie was quickly diagnosed with leptospirosis, an infection of the kidneys, and antibiotic therapy and hemodialysis treatments were initiated. Eddie was given 4 hemodialysis treatments over the course of 5 days. During his treatments, he rested on a comfy bed and received lots of love from his doctors, nurses, and even a few surprise visitors. While most patients with acute kidney injury refuse to eat (severe nausea due to toxin accumulation prevents intake of proper nutrition for recovery), Eddie never missed a meal. In fact, it was difficult to tell that Eddie was even sick, as the hemodialysis treatments removed all the accumulating toxins. After 5 days of treatment, Eddie’s kidneys began to regain function. His kidneys made a full recovery and he is now back to his day job as a star on Instagram! Thanks to dialysis, Eddie’s prognosis went from a question of “if” he would recover to “when” he would recover.